For this challenge, I experimented with Evernote. I really like the ability to annotate and email an image. 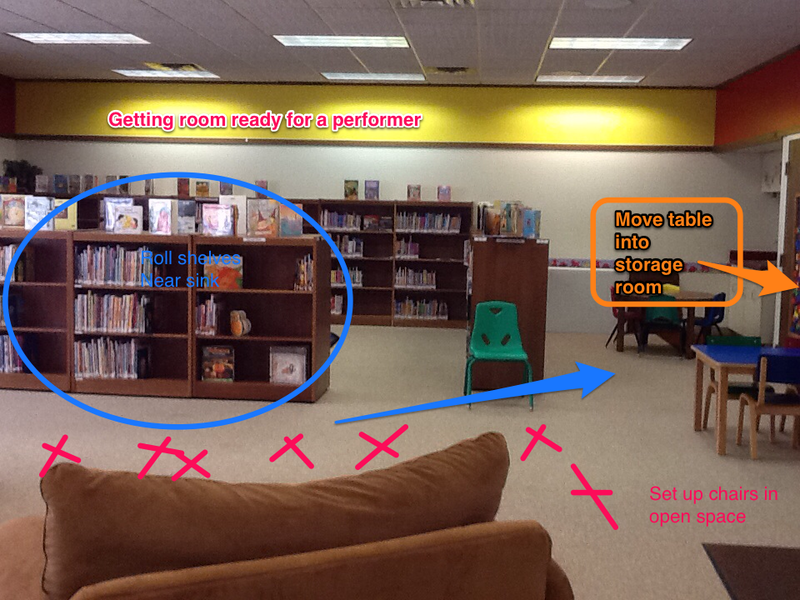 I took a picture of the Children's room and annotated as if I was trying to tell someone how to set up the room for a performer. It would be much easier to give someone the picture than to verbally communicate the easiest way to prep the room. I am also intrigued by the ability to take pictures of PostIt notes. I am notorious for leaving myself PostIts as reminders about kid appointments or shopping lists. Rather fun! I created a Zite account for this task. It took me a couple of tries to create topics that actually interest me...clearly, I'm so eclectic that that the "ready to go" topics didn't really work. :) Once I was able to target the topics a bit more precisely, I found that Zite was finding things for me that I wouldn't have discovered on my own. The MotherEarth "How to grow cucumbers" article was very helpful! I don't like that there isn't a way (or I haven't discovered it yet) to add websites that I always want to read. For example, I was able to access the Unshelved comic strip via the "Librarianship" category, but I can't figure out how to get Unshelved directly. Because while I may want professional literature often, I want Unshelved *always*. I think that Zite could be very helpful in helping find professional literature when I'm just trying to get a feel for trends, etc. If I was trying to get a thorough reading of professional literature, however, I think I would use it as a jumping off point. So often the very helpful literature isn't what is currently trending. But Zite seems great for just casual browsing. The "Frugal Living" and "Organic Gardening" stuff, though? That's fantastic! I played with the Google Goggles option in the Google Search app. I am at the library, so I am mostly restricted to objects like books, movies, and tissue boxes. I found it to be pretty reliable in identifying books and movies (although not always in the language I zapped). It took me directly to pages where those items could be purchased. I can see how a library patron might use this to find a book available for purchase that she had checked out from the library collection. I watched several youtube videos and read blogs on ios7 tips and tricks as I worked through this challenge. Since I am more or less a rookie at using an iPad to begin with, the "what's better about ios7" pieces were helpful (despite me having no knowledge of ios6). The biggest take away was closing apps. When I've used my husband's iPad, I've always just left everything open b/c until today I didn't realize that I could close them by flicking them up in the multi-tasking view. Very helpful!I also found an article that gives suggestions as to using parental controls with some degree of sophistication. At some point, my small people are going to start pushing the boundaries of appropriate use (for our family anyhow). This is my first adventure in blogging. And I tend to be very enamored with my laptop rather than a mobile device. Lots for me to learn!